The Recycled Plastic Point Reyes Picnic Table is crafted to last a lifetime. This durable and attractive picnic table will not crack, rot or sag over time and will retain its integrity long after traditional lumber picnic tables would be ready for the junkyard. Its economical price alongside its zero-maintenance advantage makes this picnic table a wise choice for any value-conscious buyer. The Recycled Plastic Point Reyes Picnic Table is made with powder coated, heavy duty cast aluminum frames for the two seats and powder coated structural steel leg assemblies for the table. Each seat has five 2" x 4" recycled plastic slats, and the table has six 2" x 4" recycled plastic slats. The table is supported with a third base to eliminate the risk of sagging. The seats are heavily braced with length and width supports. The recycled plastic slats are available in white, cedar, gray, green, and black. The powder-coated cast aluminum frames are available in either black or green. Heavy duty, zinc coated hardware in included. The picnic table (and bench seats) includes holes for surface mounting. Simply click the 'Add to Cart' button below and select your color choices. Let's all do what we can to reduce the pollution of our precious planet. Through collection, sorting, purifying and reprocessing we're keeping millions of pounds of non-biodegradable plastic refuse out of our landfills. Through years of innovation, the art of transforming plastic refuse into beautiful and durable outdoor furnishings is here. These products can be enjoyed for generations to come! Color samples are approximations only. Actual colors may vary. Need your bench engraved? Call AbundantEarth.com at 1-888-513-2784 or email us at sales@abundantearth.com for a quotation. The recycled plastic lumber used in your picnic table or bench does not need to be sealed, painted or stained, and does not rot. The proprietary dying process used includes a UV protectant that will ensure the beauty of the plastic well beyond that of wood. Stainless steel hardware ensures you won’t be replacing screws or bolts either. Maintenance departments love the ease of caring for recycled plastic. 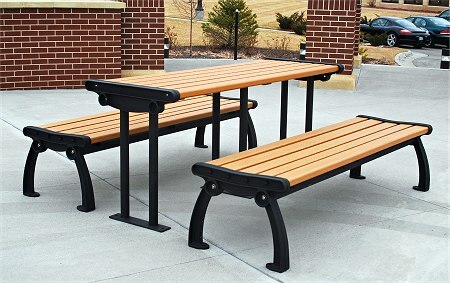 The recycled plastic lumber used in your picnic table or bench is extremely durable. Pens and markers can be washed off with household cleaning solvents. Paint will not bond to the surface and is easily removed with sandpaper or a paint scraper. Surface cuts and scratches can simply be sanded away. The sheer weight of these recycled plastic products helps deter theft. The 8-ft. picnic table, for example, weighs more than 575 pounds! If weight is not deterrent enough, you may use permanent anchor kits to secure your benches and tables to any ground surface, from concrete to dirt. The recycled plastic lumber used in your picnic table or bench is an environmentally sound choice. Not only does recycled plastic save trees, but it also reduces landfill usage. Post-consumer milk jugs, pop bottles, and plastic bags, as well as many other forms of post-consumer and post-industrial waste, are the main ingredients in recycled plastic. In fact, when the bench or table has out-lasted the life of your yard, park, office or school, simply recycle it! Additional freight charges often apply on this item. We will contact you with these additional charges, and await your approval before finalizing your order. You may also email or call for a freight quotation. Be sure to specify what you wish to order, and indicate your zip code when requesting a freight quotation. Please allow up to one business day for us to finalize your freight quotation. Our email address is sales@abundantearth.com and our toll-free telephone number is 1-888-513-2784.